A private charter bus crashed at approximately 9 p.m. in Covington Township, Pennsylvania. Images taken at the scene of the accident indicate the bus was from the Big Red Bullet company. 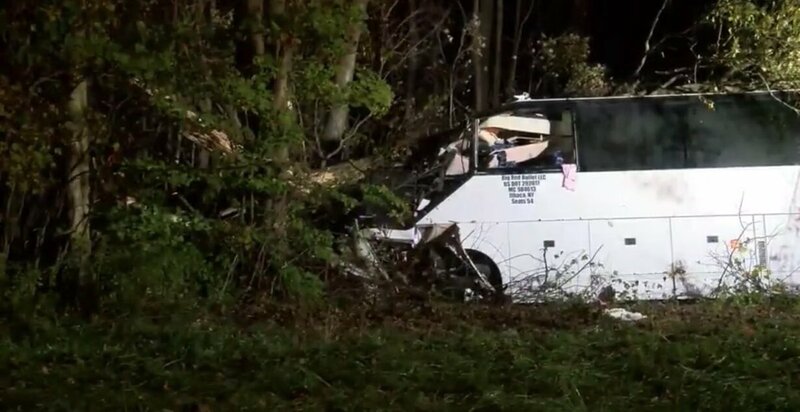 A bus traveling from Ithaca to New York City crashed in Pennsylvania, killing a Cornell University alum and injuring several other passengers Oct.14. A private charter bus crashed at approximately 9 p.m. in Covington Township, Pennsylvania. Rebecca Blanco, a Cornell alumna who graduated from the Johnson Graduate School of Management in 2017, died in the crash, according to the Pennsylvania State Police press release. Ithaca College alumna Kaitlin Logsdon ’17 said she was a passenger on the bus and declined to comment further on the events of the accident. Images taken at the scene of the accident indicate the bus was from the Big Red Bullet company. According to The Associated Press, at least three other passengers on the bus were injured, with two in good condition and one in critical condition Oct. 15. David Maley, senior public information officer at the college, said the college is not aware of any other college community members who were passengers on the bus. Joel Malina, vice president for the Division of University Relations at Cornell, issued a statement following the bus crash. According to the statement, other passengers on the bus were injured as a result of the accident. The crash is still under investigation, according to the Pennsylvania State Police press release.